Democratic Party bosses and corporate media pundits were taken aback on Tuesday March 8 when they grossly miscalculated the strength of Vermont Senator Bernie Sanders’ campaign in the state of Michigan. 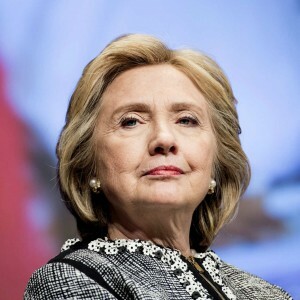 Former Secretary of State and United States Senator for New York, Hillary Clinton, was projected by pollsters to win the primary election in Michigan by 21-37 percent. Nonetheless, Sanders pulled off an upset taking over 50 percent of the vote to Clinton’s 48, winning 20,000 more votes than Clinton, exposing the flawed research methodology of the political consultants who were in error by at least 21 percent. It appears as if Sanders drew votes from regular Democratic Party stalwarts and independents: including young people, women, African Americans, Latinos and Arab Americans, to a far greater degree than anticipated by the politicians who had lined up behind Clinton. Although these same corporate media outlets and professional pollsters claimed that only 31 percent of African Americans in Michigan voted for Sanders based on exit poll results, these figures are quite questionable in light of the outcome of events in the state. In Flint, for example, as recently-elected Mayor Karen Weaver was seen in numerous Clinton campaign commercials as an endorser, Sanders outperformed the frontrunner in Genesee County where Flint is located. 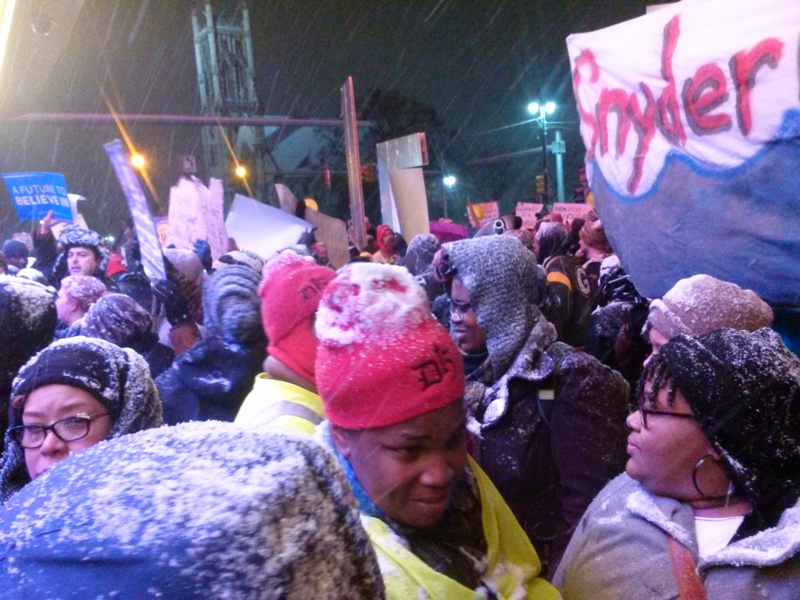 Flint was the scene of a Democratic debate on March 6 where people are outraged and traumatized by the poisoning of the public water system at the aegis of the Republican Governor Rick Snyder. Sanders’ attacks on the 1990s Clinton administration’s engineering of the North American Free Trade Agreement (NAFTA) and the deregulation of the financial industry resulting in massive personal bankruptcies, job losses and home foreclosures during the first decade of the 2000s, has resonance among Michigan residents. Although Clinton attempted to accuse Sanders of not supporting the so-called “auto bailout”, which he denied, his response during the debate centered on Clinton’s, and by implication Obama’s, continuing “bailout” of Wall Street. Despite ruling class propaganda which is echoed in the corporate and business-funded media, actual unemployment and poverty in Michigan is still far higher than the national average. 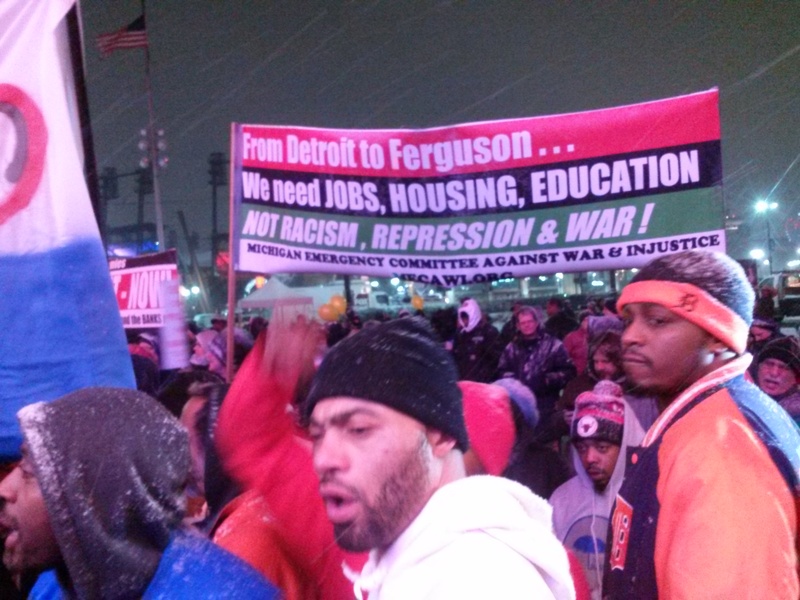 Majority African American cities have been subjected to emergency management and bankruptcy in the case of Detroit, stripping away basic bourgeois democratic rights such as local control over municipalities and school systems. A Democratic administration under President Barack Obama in effect supported the imposition of emergency management and bankruptcy in Detroit and other cities. As a result billions in pension funds, healthcare benefits, public assets and services were turned over to financial and corporate interests. Clinton campaign bosses relied on what has been perceived as the loyal base of the party encompassing elected officials, union leaders, African American churches and women to the detriment of its own strategy in the state. They falsely assumed that the bulk of potential voters were to be found within the confines of precinct delegate organizations, labor service representatives, religious groups and what is thought of as being the mainstream civil rights organizations. Nonetheless, over half of the people who voted in the Democratic primary illustrated the rejection of the superficial sloganeering and patronizing nature of the Clinton campaign approach. These perceived Democratic Party constituencies are in a state of fluidity due to the economic downturn that has hit the state of Michigan and other regions of the country. In Detroit, where the first white mayor in 40 years was installed amid emergency management and bankruptcy during 2013, the “city administration” lacks real grassroots support which has been revealed in public meetings where Mike Duggan and other officials have been shouted down. With the downsizing of heavy industry along with municipal services, hundreds of thousands of unionized workers have lost their jobs. As it relates to the status of African American churches, in many communities where these religious institutions are located, the crises of job losses combined with home foreclosures, evictions and utility shut-offs, has dislocated hundreds of thousands of people. In Detroit many leading churches which had thousands of members less than two decades ago, have been reduced to several hundred people, many of whom are senior citizens. These issues related to perennial unemployment, increasing poverty, mass incarceration, police brutality and judicial impunity have persisted under the Obama administration. Eight years ago many African Americans, Latinos, women, LGBTQ communities, Middle Eastern and Asian populations voted in mass in support of Obama and the Democratic ticket. Since this time period, the failure of a Democratic-dominated Congress and White House during 2006-2010 to deliver on minimal reforms has left a degree of intolerance for these same empty promises in regard to the ongoing decline in living standards and political empowerment. Sanders campaign personnel have been evident by working quietly on the ground in the Michigan since Labor Day weekend in 2015. Supporters of Sanders participated in the Labor Day parade where tens of thousands of unionists attend. 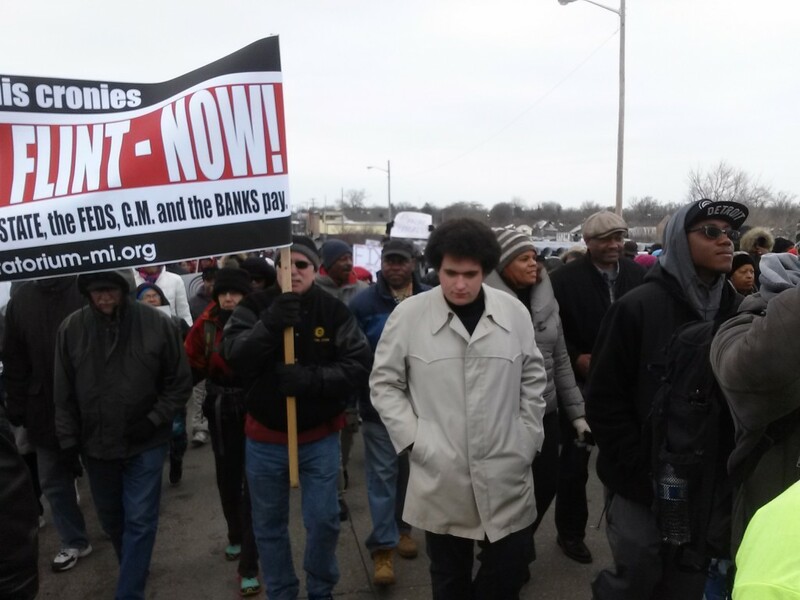 They were at the annual Dr. Martin Luther King, Jr. Day demonstration in Detroit, the largest gathering of progressive forces throughout the southeast region of the state. Sanders’ people were outside the Fox Theater during demonstrations on March 3 against the Republican debate. These developments portend much for the outcome of the primary process as well as the upcoming November general elections. Despite the claims of Clinton supporters, African Americans and other oppressed groups, compounded with the workers and youth, are looking for more than the same dubious approach to racial, gender, foreign affairs and economic policies. The fracturing of the Democratic Party base is in part a manifestation of the inability of the Obama administration to deliver on any sustainable programs mandated by the electorate eight years ago. In order to win the general elections against a possible Republican campaign of Donald Trump which has mobilized right-wing, racist and proto-fascist sentiments among broad segments of the white population, the Democratic Party must overcome the lack of enthusiasm surrounding its purported leading candidate. Moreover, the lack of real democratic practice within the party is starkly evident where according to official counts, Clinton holds far more delegates than Sanders even though her margin of victory in regard to state primaries and caucuses remained thin leading into the battle for Ohio, Illinois and other states in March and April. If these Sanders supporters who have come out in the tens of thousands to rallies on campuses and community venues failed to embrace the political will of the Democratic National Committee’s apparent bias in favor of Clinton, it could create the conditions for a Republican victory irrespective of whether Trump is finally selected to run in November. As the results of the Obama electoral victories of 2008 and 2012 clearly illustrate, the majority of people in the U.S. can be mobilized into an alliance containing African Americans, Latinos, women, labor, Asians, Middle Easterners, LGBTQ communities, environmentalists and others. If the Sanders campaign fails to secure the nomination, which would have a better chance of defeating a possible Trump candidacy, then these same social elements which elected Obama twice must be independently organized concentrating on a broader and deeper program based upon their national and class interests. In fact the realization of fundamental change in the U.S. will not come from the election of Democratic administrations and Congresses. The Democratic Party is still a manifestation of the ruling class which inherently reinforces national oppression, class exploitation of the workers and the poor, and the continuation of imperialist war against underdeveloped states internationally. The workers, youth, women and all other oppressed sectors of the population need their own political party which can speak directly to the existing social conditions. Only when the workers and oppressed take power in their own name can a real political revolution take place.